100-year-old man finishes marathon. what's your excuse? I am not a runner. I hate running. Hell, I hate walking briskly. But I know several folks who participated in marathons over the weekend. More power to you, my friends. You think you're special? 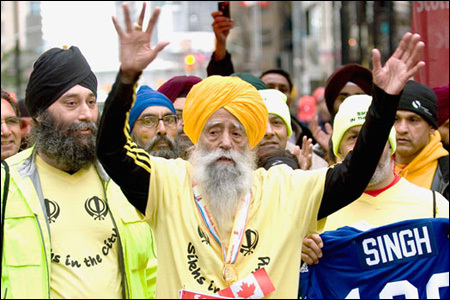 Fauja Singh ran and completed a marathon in Toronto. And he's 100 years old: Who, What, Why: How can a 100-year-old run a marathon? In Sunday's Scotiabank Toronto Waterfront Marathon, Singh, nicknamed the Turban Tornado, finished in a little more than eight hours — some six hours after the race's winner, Kenya's Kenneth Mungara, according to CDC News in Toronto, Canada. Singh only speaks Punjabi so his coach and translator, Harmander Singh, told CBC News, "He's overjoyed. Earlier, just before we came around the [final] corner, he said, 'Achieving this will be like getting married again.'" Singh started running 20 years ago at the tender age of 89, after the death of his wife and child. Since then, he has run eight marathons, including Sunday's. He's broken records for various distances in the 90-plus and now 100-plus categories and carried the torch during the torch relay for the 2004 Athens Games. More here: 100-year-old Breaks Guinness World Marathon Record. This was Singh's tenth marathon. He says it won't be his last. Like I said, badass.